The easiest way to “clay”! Using a clay bar to remove embedded surface contaminants was a stroke of genius – how else could we hope to achieve that perfect look without them!? But, such as life, things have evolved and we now have an alternate to using a traditional clay bar. BLACKFIRE Clay Mitt works the same way as a standard clay bar, but with a much easier application! Rather than having to knead your clay bar multiple times during a detail, you can simply rinse away removed contaminants from the mitt and continue on! And if BLACKFIRE Clay Mitt is dropped during use, you don’t have to throw it away, just rinse and keep going! You’re now able to combine two previously separate steps – the washing and the claying – into one! Use BLACKFIRE Clay Lubricant to allow your BLACKFIRE Clay Mitt to move freely across the surface to remove embedded paint contaminants. 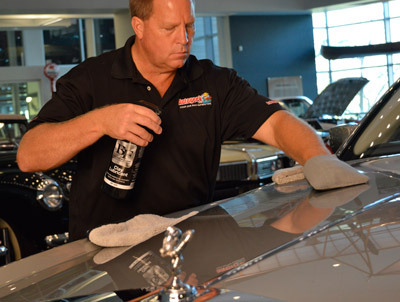 Removing contaminants from your paint is an important step in detailing, but that doesn’t mean it has to be hard! BLACKFIRE Clay Mitt will remove embedded surface contaminants such as over-spray, road grime, dirt, industrial fall-out, tree sap, and more and will allow you to have the perfect gloss and finish you’re always working for! The Blackfire Clay Mitt is manufactured with a protective coating that must be removed before use. Simply use the Clay Mitt as directed on glass to remove the coating. When using the Clay Mitt during your regular washing routine, first remove all loose dirt and debris. Submerge the Clay Mitt in your bucket of soapy water and re-wash your vehicle one panel at a time. Be sure to start at the top and make your way toward the bottom to avoid cross-contamination. Regularly reload the Clay Mitt with soap and water for ample lubrication. Rinse and dry your vehicle as normal. When using the Clay Mitt on it's own with a dedicated clay lubricant, first wash the car to remove all loose dirt and debris. Spray a liberal amount of Blackfire Clay Lubricant onto the surface, working one panel at a time. Gently move the Clay Mitt back and forth across the paint in a criss-crossing motion. Dry the panel you've just worked on before moving on to the next panel. Work only on a cool surface out of direct sunlight. To preserve the life of your Clay Mitt, store in the original packaging with rubber coating facing up.